Gaining experience, knowledge and race craft in the 2018 Cooper Tires USF2000 Championship Powered by Mazda, Sabré Cook has been able to compete at some of North America’s premier facilities and events. Working hand in hand with marketing partners, Cook is pleased to welcome Alpine Bank as the co-primary partner of her #31 Team BENIK entry. Alpine Bank will join long-time Sabré Cook Racing partner Apple Motorsports in a joint effort for this weekend’s triple-header. Alpine Bank is employee-owned, locally operated, and has been a part of Colorado since 1973. With 38 convenient locations, most recently including the bank’s first Front Range branches in Denver’s Union Station and Cherry Creek North neighborhoods, Alpine Bank serves more than 130,000 customers with retail, business, wealth management, mortgage and electronic banking services. A growing company, Alpine Bank is forever committed to remaining the true community bank they’ve always been. At Alpine Bank, many of their employees and managers have been with the company for ten years or longer. This dedication allows them to build long-term community and customer relationships. 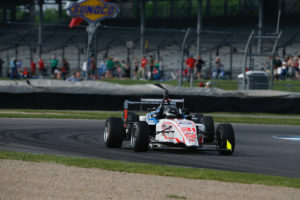 Debuting her new livery during rounds ten and eleven of the Cooper Tires USF2000 Championship Powered by Mazda, Cook will take on the Mid-Ohio Sports Car Course this coming weekend. Sabré Cook would like to thank her marketing partners for their continued support. A huge thanks to Alpine Bank, COTA Karting, MESA Fitness, Bell Racing USA, Apple Motorsports, Aspen Equity Group, and Grand Junction Motor Speedway.